Below you'll find answers to the most frequently asked questions. What is the quality of the label weaves? The standard weave quality we use at www.eelabelfactory.com is luxury damask. An excellent quality that perfectly reproduces every detail of your logo . 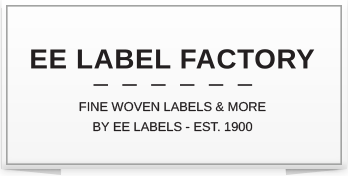 What quality yarn doe we use for woven labels and size labels? We only work with polyester yarns. 40% of these yearns are New Life recycled yarns. Can I also order different yarn qualities? JYou can also use other yarn qualities for your label, such as organic cotton, wool, and silk. The colour selection is more limited and your artwork must be suited to it. In addition, larger quantities, higher prices and longer delivery times apply than you’ll find in our online store. Please contact our sales department about this, they will help you with a custom proposal. What is the minimum amount that I can order? You can order from a minimum of 500 pieces up to 4,000 pieces via our shop, www.eelabelfactory.com. Of course you can also place larger orders, but then we ask you to contact our sales for a custom quote. We’ll send you a pack of example labels free or charge. E-mail us (info@eelabelfactory.com) your information and you will receive samples the following day. Can I receive a sample label with my own artwork? Our preview will give you a good idea of the end product, but if you want 100% certainty with regard to color and production, then we recommend you have a label woven in advance. A sample will cost € 75,-. The sample will be shipped to you straight from the machine due to the fast delivery time. This means it is not yet cut and folded but you can check the quality of your woven logo. After ordering your label will be cut and gets the fold you selected. Can I order other products such as hang tags, packaging, metal / PVC / leather or strapping labels? EE Labels is a "trusted branding partner". We provide a wide range of products that are necessary to promote your brand image on end products. These cannot yet be ordered via EE Label Factory. We ask that you contact our sales department. Which file extensions can I use to upload my artwork? You can upload artwork for your label as a tif, eps, psd, jpeg, gif, png, bmp or svg file. If you run into problems, please get in touch with our customer service department. What are the preconditions/rights for use artwork? You may only upload artwork or logos that are not copyrighted or that you own the rights to yourself. We cannot in any way be held responsible for checking these rights. Can I design the labels myself? Our shop was designed for you to be able to upload your logo completely, determine the sizes, choose the colours and then order the right quantity. What is the advantage of ordering online? The delivery time from direct ordering through our online store is just 7 business days. That is much faster than the conventional ordering method. If you have your own account, you will see your order process and order history. How do I know if my order has arrived, as I have not yet received confirmation? After completing the entire ordering process and submitting payment, you will receive an order confirmation by e-mail. If you have not received anything, please contact our customer service because something went wrong. Can I cancel my order after I have paid and received an order confirmation? Your order goes directly to production planning to guarantee the 7-business-day delivery time. So once you have received an order confirmation from us, cancellation is unfortunately no longer possible. Within NL and BE, we ship via GLS, outside of that we use TNT. You will receive an e-mail from us with the track and trace information once the package has been shipped. We guarantee a delivery time of 7 business days. If everything is in order, you’ll receive an e-mail from us once your order has been shipped. Check the track and trace details that were in the e-mail to follow your shipment. For deliveries within the Netherlands and Belgium, we use GLS. The cost is € 16/per shipment excl. VAT. For deliveries outside the Netherlands and Belgium, we use TNT The cost is € 42.50/per shipment excl. VAT. If I order multiple items, will the entire order be sent at once? If you have ordered several items at the same time, they will be sent as one order. What are the legal conditions for uploading a logo? To accommodate every customer as much as possible we offer various options for payment in advance : IDEAL, PayPal, Visa/Mastercard and Maestro. Only regular EE Labels customers have the option to pay on account. These long-term relationships give us more payment security. We count on your understanding and hope to build that kind of relationship with you. Why am I being charged a colour surcharge? The standard price for a woven label is calculated on the basis of 1 foundation color (= background color) and 1 figure color. If your artwork contains multiple figure colours, then an extra % will be charged for this simply because it takes longer to weave. What if I’m not happy with the labels I received? The labels are produced specifically for you based on the supplied artwork. The artwork is your property, so we cannot give it to third parties. But if you are not satisfied with the final product, we will solve it. We request that you return the order to us within three business days of receipt with a clear description of the complaint. We then discuss this complaint with you personally. If the complaint is well-founded, we will remake the order as soon as possible, including a sample in advance for approval. What is a well-founded complaint for rejecting an order? Our quality control checks your artwork very carefully, along with the accompanying order confirmation with the woven label before the order is sent. But errors can still sometimes be overlooked. A flaw due to snapped yarn, a wrong colour .... Let us know and we’ll discuss your complaint and search for a suitable solution together.